I love summer best of all, but pumpkin anything and holiday treats help me make it through fall and winter. This fall I am on a mission to find THE perfect pumpkin cupcake. I found several on the internet this weekend, but when I stumbled on one that was chocolate I knew I had to try that one first! Mamma graciously agreed to be my sous chef and even assisted in gathering the ingredients for a photo! I admit I was a little dubious about this recipe at first. I love pumpkin and I love chocolate, but I wasn’t sure how they would be together. 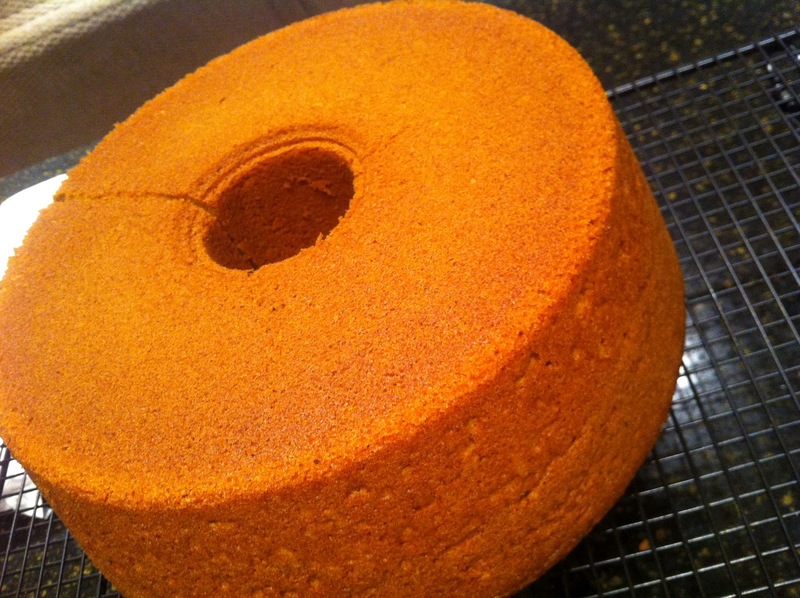 As pumpkin was my primary flavor objective, I decided to up the pumpkin on this recipe. 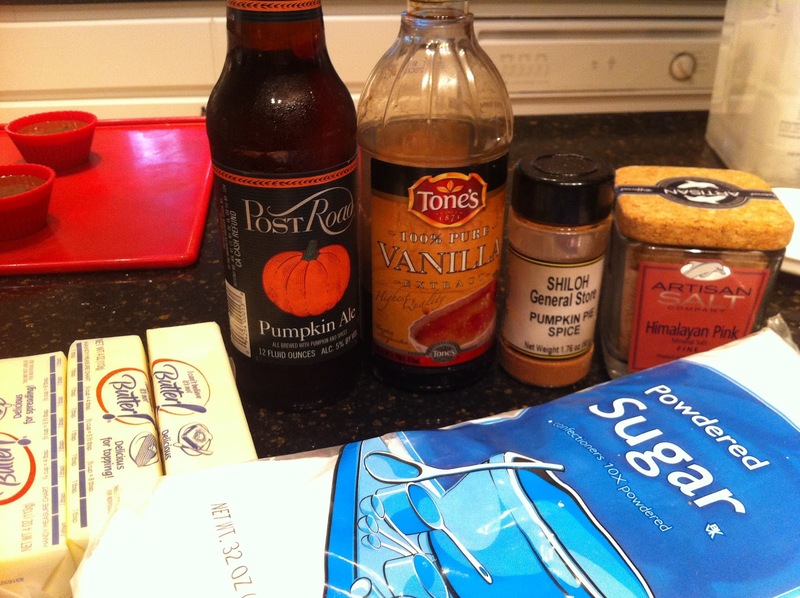 Instead of just using the pumpkin ale, I also added 3/4 cup of pumpkin. I cut down the amount of sour cream to about 3 tablespoons. Yep, there’s pumpkin beer in there! Yum! 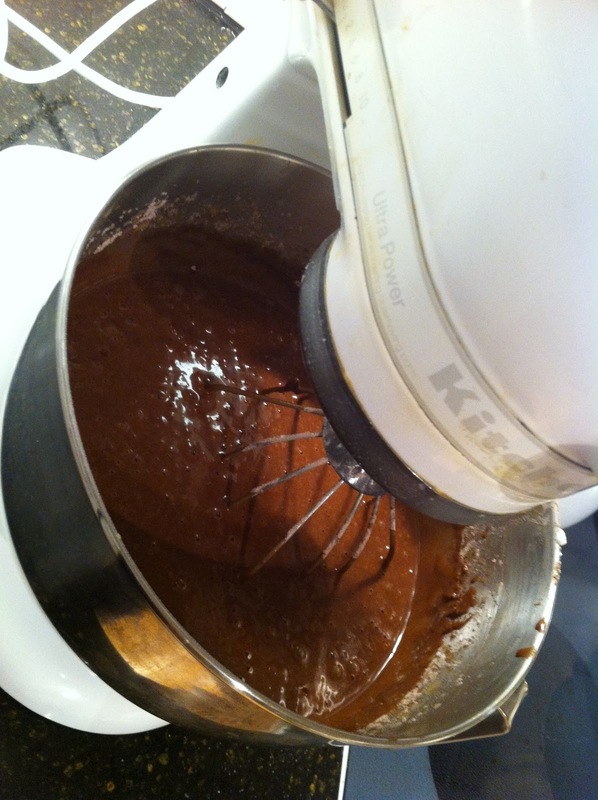 And now it’s getting chocolatey! 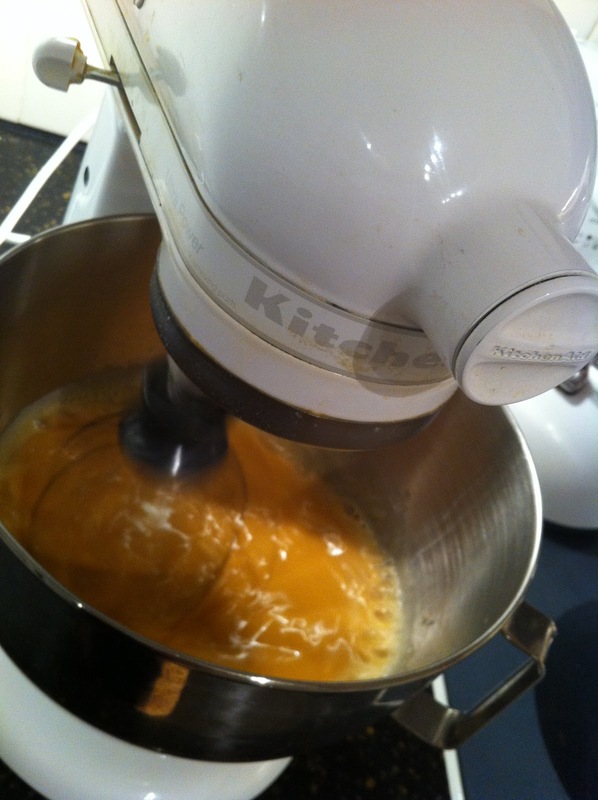 True to the recipe instructions, the batter is very runny, but don’t worry! And now we bake at 350 degrees for 25 minutes. I often find cooking times unreliable, but 25 minutes was right on the nose for this. The recipe does say this makes 24 cupcakes. Our batch actually made 30 cupcakes. 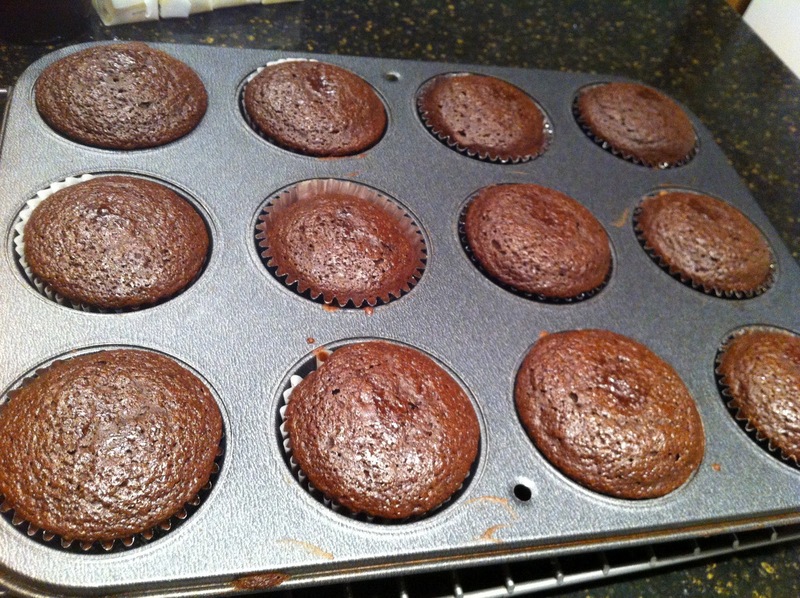 I think the secret to pretty cupcakes is to not overfill each cupcake well. This also means more cupcakes, yah! 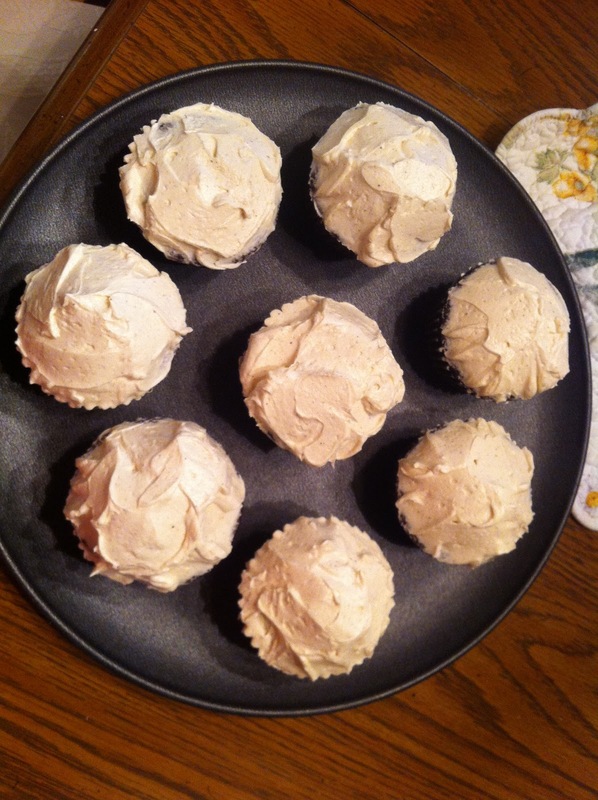 I think these cupcakes would be great with just a basic cream cheese icing, but the buttercream icing recipe is also quite yummy. 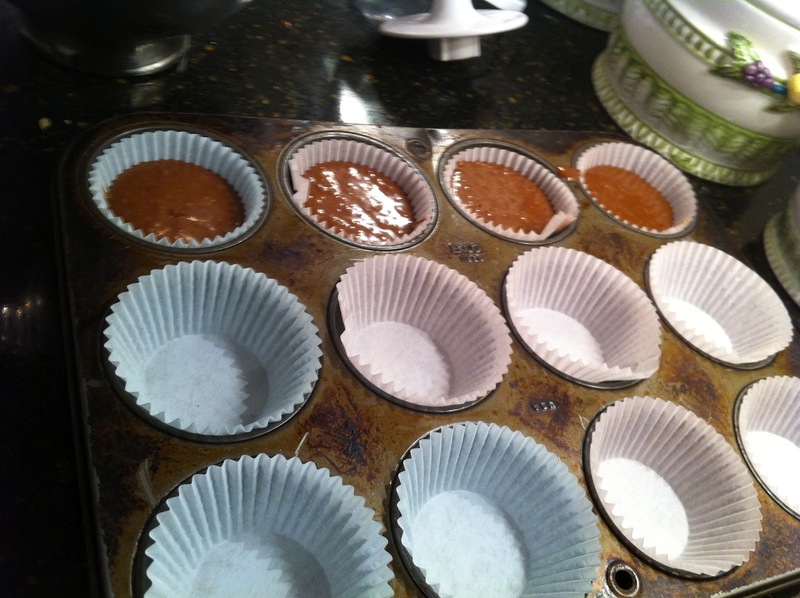 We decided to cut the icing recipe in half and we had plenty to ice each yummy cuppycake! And now for the final touch. This recipe turned out to be a lot of fun. The combination of rich dense chocolate flavor combined with the spicy pumpkin and pumpkin ale flavors was very unique. I would definitely make these again. 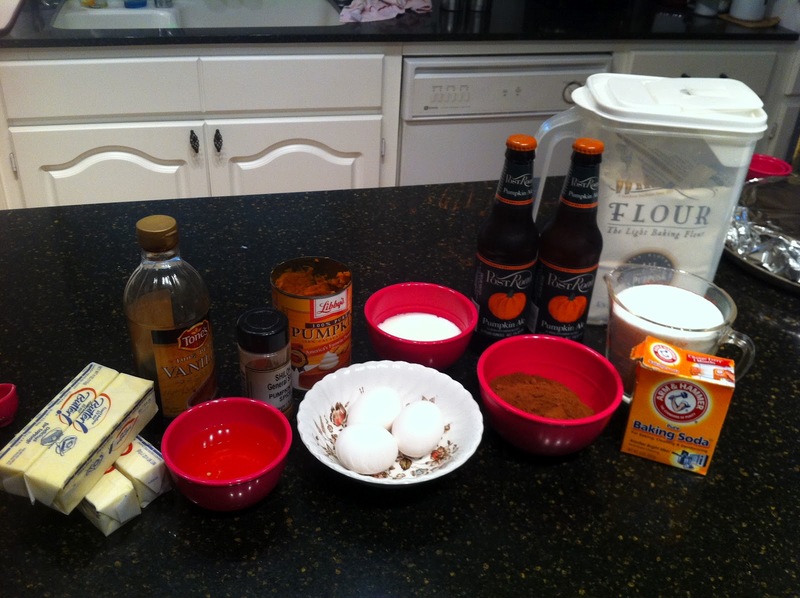 If you know of any pumpkin recipe I should try, please let me know! I’m sure this never happens to my food blogger idols like the Pioneer Woman, but sometimes supper just doesn’t work out like you hoped it would. 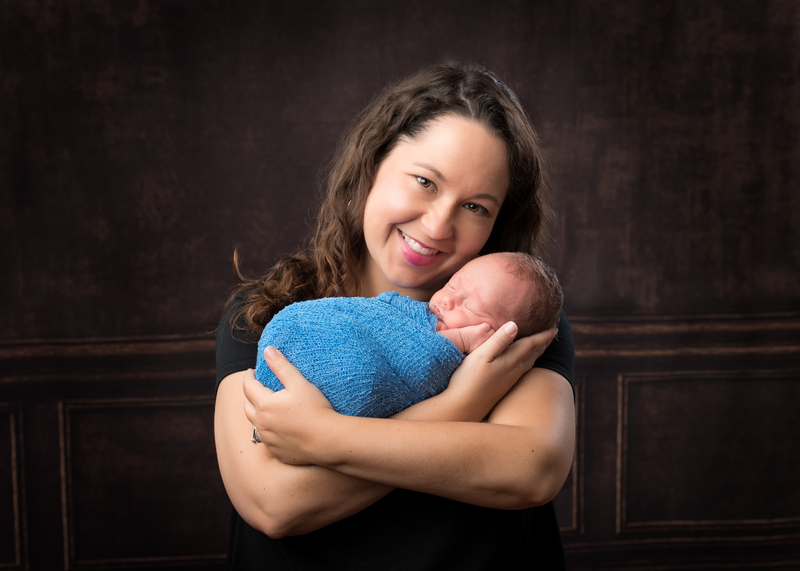 There are some nights you plan to go home and get into your pjs straight after work and have wine or perhaps a can of icing for supper, but some days it’s just a last resort. My Dad (bless his heart) tried to make hamburgers in a basket for our supper tonight and it was a dismal failure. Perhaps dismal is too strong a word. It really wasn’t horrible, it just wasn’t good but we are apparently food snobs in my family and refused to eat it. Hamburgers in a basket is sort of a 70’s fabulous dinner item that is an old favorite of ours. We haven’t had it in quite awhile and Daddy thought it was a good idea to break out an old favorite. The recipe is simple. You put a hamburger patty in a packet made of tin foil and top it with sliced potatoes, onions, carrots and green pepper. Season it all well and put it in the oven for about an hour. The secret is in the seasoning. My Dad always accuses Mamma and me of over salting everything. 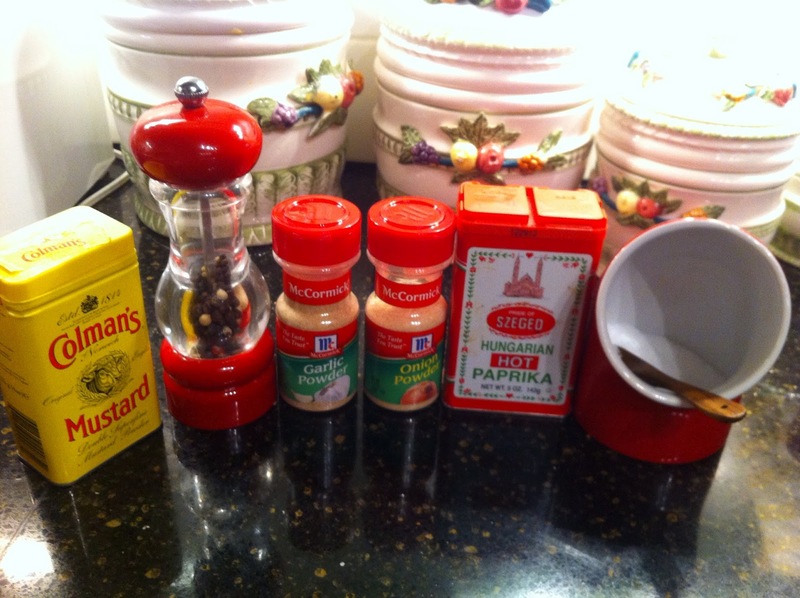 The secret to the recipe really is in the seasoning though. You have to coat this stuff down with salt, pepper, seasoned salt and Worcestershire. 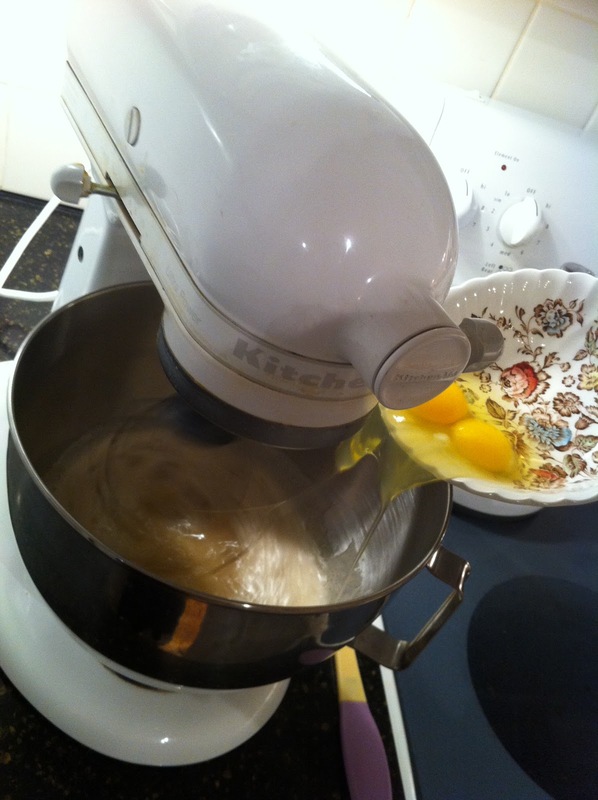 “Why are you putting that recipe in a blog. I’ve always hated that recipe. It’s not good. The potatoes don’t cook up crispy enough in that foil,” says Mamma. Well, clearly after all these years Mom has decided to confess her hatred of hamburgers in a basket. I agree with her that the potatoes don’t get crispy. However, if it is seasoned correctly I still think this is a fast and easy weeknight menu item. One pot (or packet of foil, as the case may be) meals are always good for busy week nights. Unfortunately, Daddy seems to have a seasoning phobia and failed to put enough salt, pepper, seasoned salt or even Worcestershire sauce on the burgers in a basket. Flavorless meat and veggies are just a major bummer. If you decide to try burgers in a basket, salt, pepper and season till your heart’s content. I promise it will be good. I think some Tony Cachere’s would be great on it! Maybe I’ll try that next time. 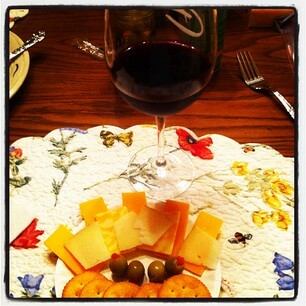 Sadly, tonight’s supper was a failure so we ended up eating cheese, crackers, olives and wine for supper. Really the only downside to having large amounts of wine and cheese as a meal on a Tuesday night is that it may make you feel like crying at random commercials like the University Phoenix of Commercial. Are they really using Amazing Grace as the background music? The pork loin was rescued from the freezer and we searched various cookbooks and the internet for a recipe before finally deciding to make up our recipe. 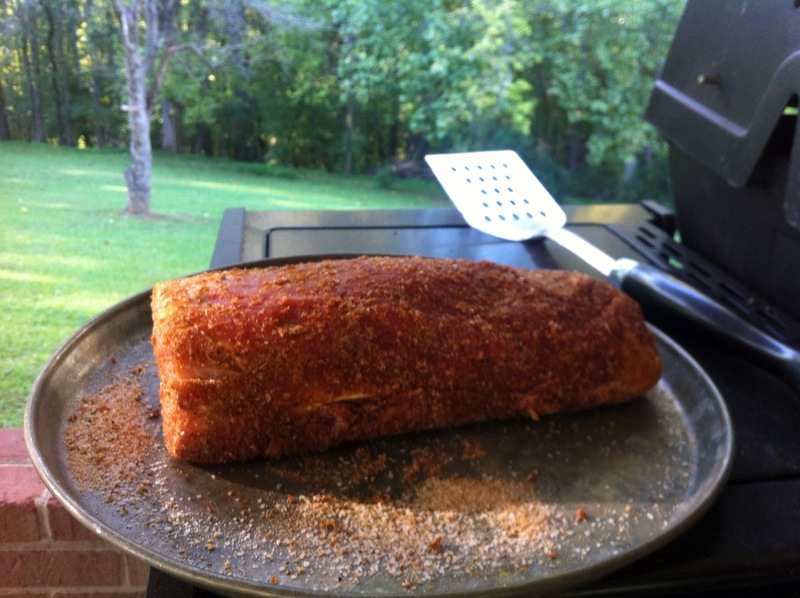 A friend of ours makes a fantastic dry rubbed pork loin and we used his seasonings. Unfortunately, we didn’t exactly have the measurements so we pulled some spices out of the spice drawer and started dumping stuff in the bowl! 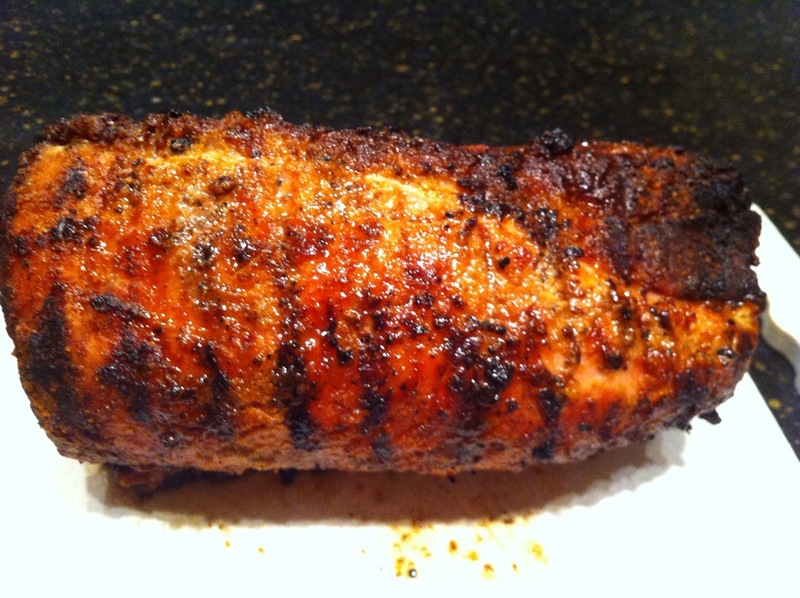 Yummy spiced up pork loin all ready for the grill! Our next menu item was recommended by a family friend. This recipe combines a vegetable with one of our all-time favorite ingredients. . .bacon! Cut a cabbage head into four quarters, sprinkle with salt, pepper and seasoned salt. Wrap with two strips of bacon. 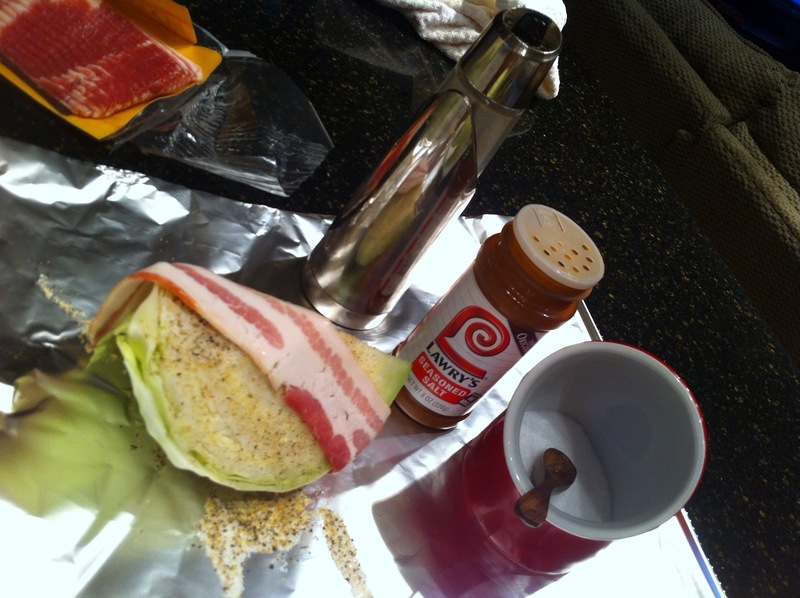 Wrap bacon-wrapped cabbage quarters tightly in foil and cook on the grill for 45 minutes to an hour. The bacon wasn’t quite crispy enough for us so we unwrapped them and put them in the oven on broil for about 5 minutes. YumEE! We need a fun name for these! Our sweet cousins brought us a whole bunch of jonagold apples that they picked straight from an orchard in Ohio. We just had to incorporate these beauties into our meal. 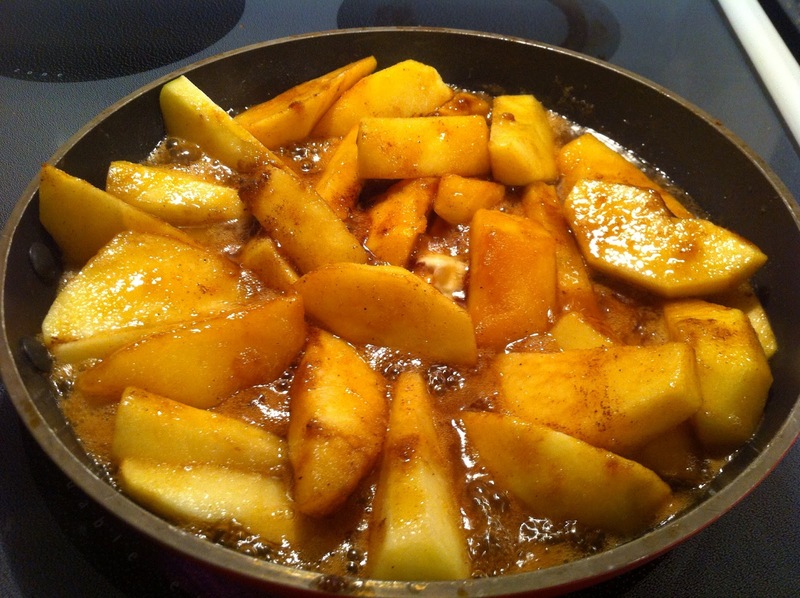 We threw in a pan with a stick of butter, brown sugar, white sugar and a sprinkle of cinnamon. It’s fruit! It’s good for you. Yum! 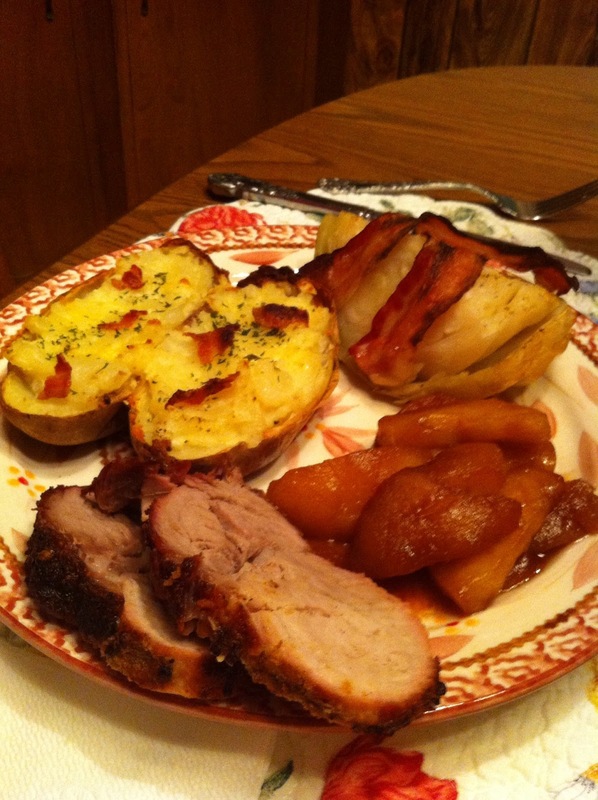 So just to recap, we had grilled pork loin, bacon wrapped grilled cabbage, twice baked potatoes and cinnamon apples. We were all pretty much stuffed by the time we finished eating, but it was all delicious! Close shot of the pork loin. Yum! 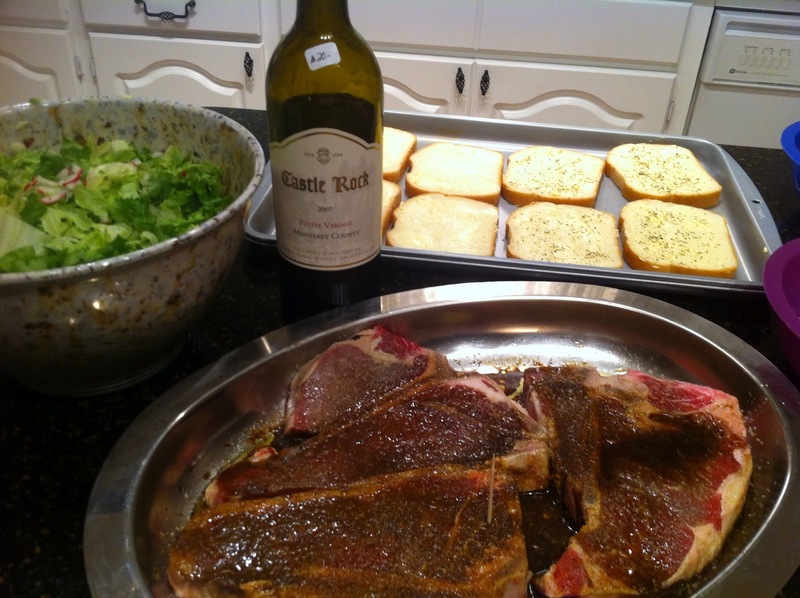 Many thanks to Mamma and Morgan (that’s my boyfriend;) who helped (ok, did most of the work) put this meal together. Yum!